Orbiter was 262,570,622km away. Not bad signal for that range on S-band, but then receiving on 10m dish helps a bit. First two screenshots are taken just before it flew behind the Mars. 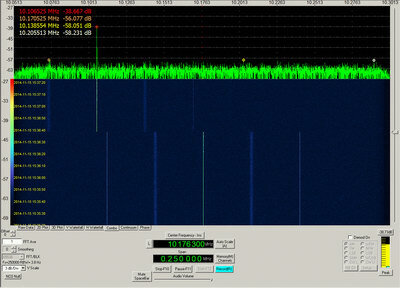 Signal was noticeably stronger before and weaker when it appeared again, about hour later. When signal reappeared, Madrid ground station transmitted to MOM, swept the downlink and locked it to uplink signal. On last screenshot, unlock can be seen with typical frequency shift. Sideband signal level increased little bit when uplink was locked and decreased again on unlock. Signal looked weak, but thanks to the Turbo coding, it took just 1-2 iterations to get perfect copy! So 10m dish is more than enough for correct demodulation and decoding of MOM telemetry.